Last night on the NovaFM’S Smallzy’s Surgery, Smallzy visited Mark Ronson in his L.A Studio to talk about his latest and greatest collaborations, what it was like working with Lady Gaga, what’s coming up next for Ronson, as well as revealing the launch date for Late Night Feelings Album, following the launch of the same titled song in collaboration with Lykke Li earlier today. Smallzy: Mark Ronson, thanks for having us mate. Smallzy: So I’m just having a little moment.. to paint a picture, we’re in the midst of Hollywood, you walk outside and you’re in the midst of it all, you walk into a non-descriptive building, and on this couch we are sitting on, I saw in the Lady Gaga documentary, and im like ‘Ive seen this room before!” and this is the room where parts were filmed..
Mark: I think there were things filmed in here – this couch I inherited with the studio so who knows what happened to this Couch! Smallzy: I come with good news – your song with Miley Cyrus is doing incredibly well in Australia! Mark: Well thank you! I see, I follow your twitter and I Can see – it’s been insane and so great, and it’s funny, I always get to come over to Australia at the beginning of the promotion of the record, example Uptown Funk, and this will be the longest break – I can’t wait to actually go and finally get to play this record out, because it’s done well there [In Australia]. Smallzy: and you’re as low key as ever! You’ve had some massive success in the last little while – how do you stay so grounded? 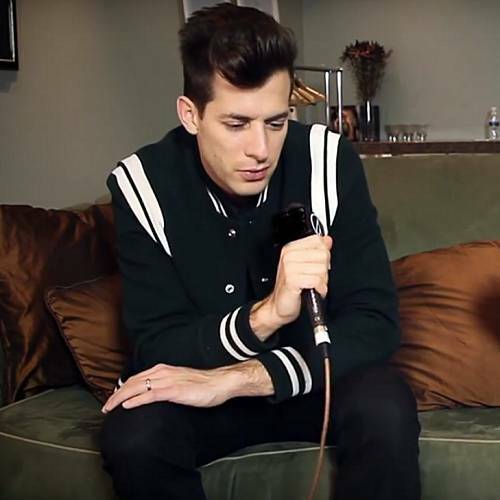 Mark: you know what it is – it is amazing with all the success of Shallow, and now with the Miley Song [Nothing Breaks Like A Heart], at the end of the day, at the beginning of the day I do the same thing every morning and kind of make music – you sit in front of the desk and hope something good comes out!! Smallzy: so you come in here every day and you’re making music, do you know you’re making something that will be as big as the songs you have had? Or do you have more songs that haven’t done much? Smallzy: Did you know you were writing for the movie? Smallzy: When did you cry in the movie? surely you cried in A Star Is Born? Mark: I did – Bradley Cooper n Rehab, - I think he’s just such a good actor conveying that stuff. I think that’s why he’s so popular, obviously he’s an incredibly beautiful specimen of a man and you’re just like ‘id hang out with that guy he’s so cool and so handsome but not in vein’ – he’s a dudes dude! Smallzy: Now, you’re album, number five, it’s called Late Night Feelings and it’s on its way soon, yes? Smallzy: What can you tell me about the project? Smallzy: As you said you don’t sing in it so it’s a record full of collaborations – are you at a point where you can talk about it? Mark: Yeah of course, the album started really with trying a lot of stuff out in the studio, I had a few ideas but nothing seemed to be very good or was exciting enough, and then I wrote this song Late Night Feelings with Lykke Li, and I knew this was going to be a bit of a DJ heartbreak record but Lykke came up with the lyrics for Late Night Feelings and I like how it sounded quite modern and almost hip hop, and it could be about anything that keeps you up at night, it could be lust, it could be love, heartbreak – and in that last five minutes before you sleep your brain goes through this like slightly funny feeling where you have like fantasy stuff – I love the idea of calling the album Late Night Feelings – I thought it summed everything up. And Lykke is on quite a few songs on the record, there’s King princess, Yebe, there’s Miley obviously, Alicia Keys, Camilla Cabello, and some new people – it was just whoever seemed willing and ready to go to that same zone of what this record was about. Smallzy: oh nice, and do you know when you wanna birth that to the world? Smallzy: Any plans to visit oz again? It has been a little while..
Mark: Definitely – I always have the best shows there and the best time playing there, so I will be there at some point.